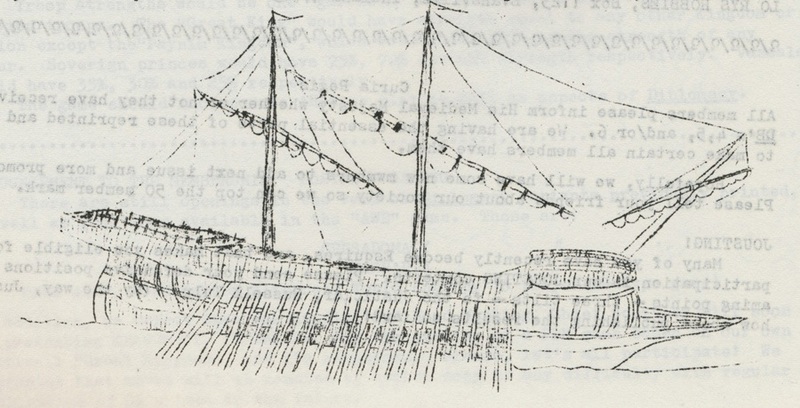 Dave Arneson had a well-documented love of boats, especially sailing ships. 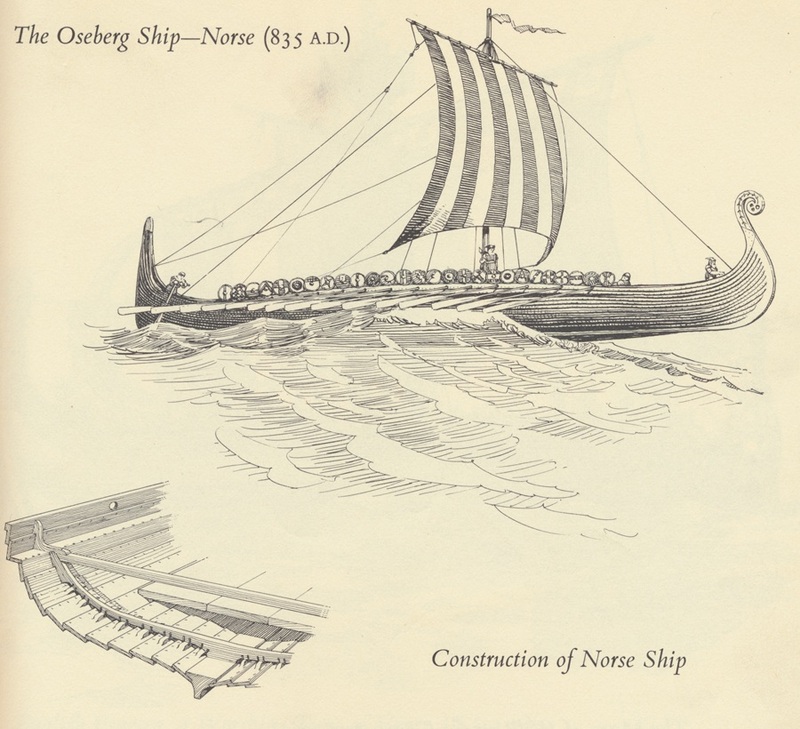 Around the time that Dungeons & Dragons was developed, we see this especially in his work on the Don't Give Up the Ship naval miniature wargaming rules, as well as his unpublished Ships of the Line campaign system. 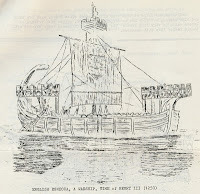 His interest was not limited to the Great Age of Sail, however: Arneson contributed several illustrated articles to the Domesday Book about medieval naval warfare. 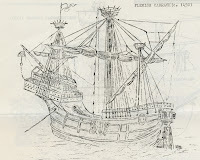 Those who know Arneson's drawings only from his monster sketches in Dungeons & Dragons or the cartoons in the First Fantasy Campaign may find the level of detail in these illustrations uncharacteristic - but in keeping with the customs of the time, these illustrations were surreptitiously copied from existing sources. 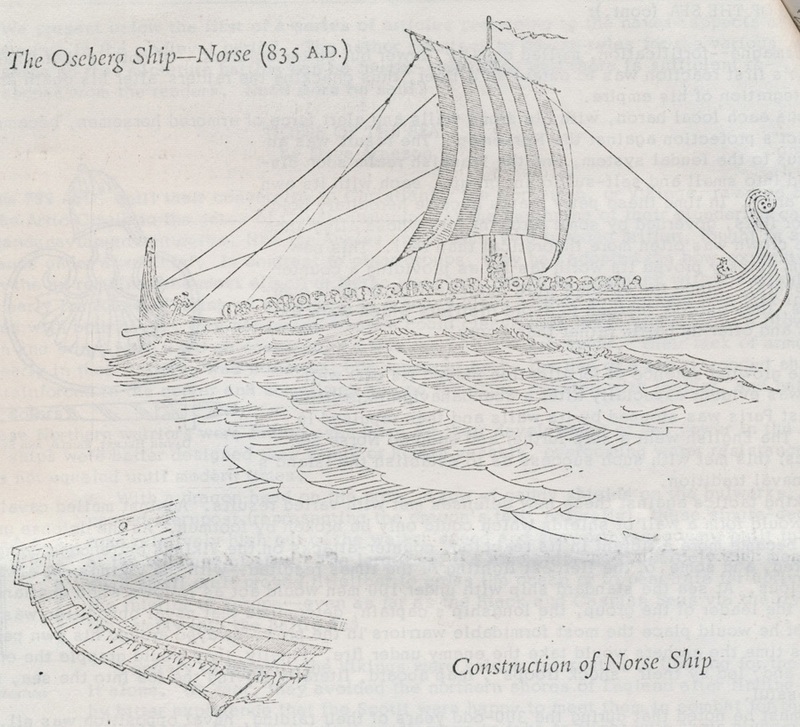 The Viking longboat above, for example, attached to Arneson's article "Tigers of the Sea" (DB #5) is obviously (but without credit) reproduced from Edwin Tunis's Oars, Sails and Steam (1951). After Domesday Book #5 went to print, Gygax lost his job and with it access to the high-end photo-offset graphics we find in early issues. When Chris Schleicher took over production of the zine, all artwork needed to be transferred by hand to mimeograph stencils. 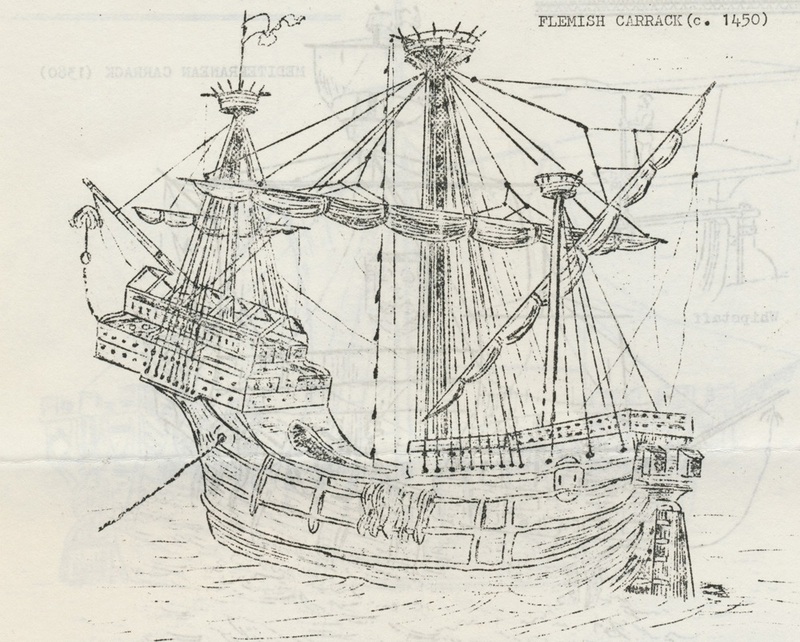 Thus the DB #6 article "Sailing Ships Through the Years," which further plunders Tunis, contains recreations of the ship graphics instead of photocopies. While the article does not bear any byline, the text itself replicates Tunis (page 22 through 29) quite faithfully. The renditions of Tunis's nine illustrations for these complicated vessels sometimes introduce simplifications, especially at the edges, but they reproduce the primary elements with considerable fidelity. For instance, the reflection in Tunis's version above has been largely reduced to a blur by the trace. While the inherent limitations of the mimeograph format preclude approaching the clarity of the original, some substantial changes have been made: small elements like the pennant on the forecastle have been dropped. 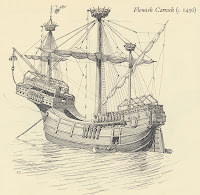 Or in the carrack image below, the landing boat at the waterline in Tunis has been removed entirely in the DB #6 version. 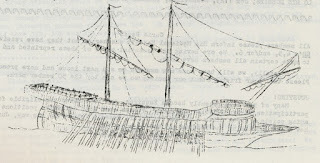 We can see in this ship many elements that Arneson learned from Tunis: the battering ram at the prow, the furled sails, the rows of oars. 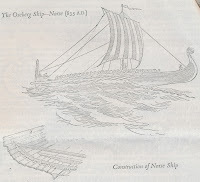 In those components we also find a prototype for the many less formal illustrations Arneson provides in the First Fantasy Campaign of oared ships with sails furled at a diagonal (though for the dragon head and tail, we must look to the original Viking ship above). These articles and illustrations reveal the huge difficulties that face scholars studying material from this period. It is no secret that artists like Greg Bell and Don Lowry copied many elements of their work from existing sources, and this can leave us with a great deal of uncertainty when trying to isolate their styles. 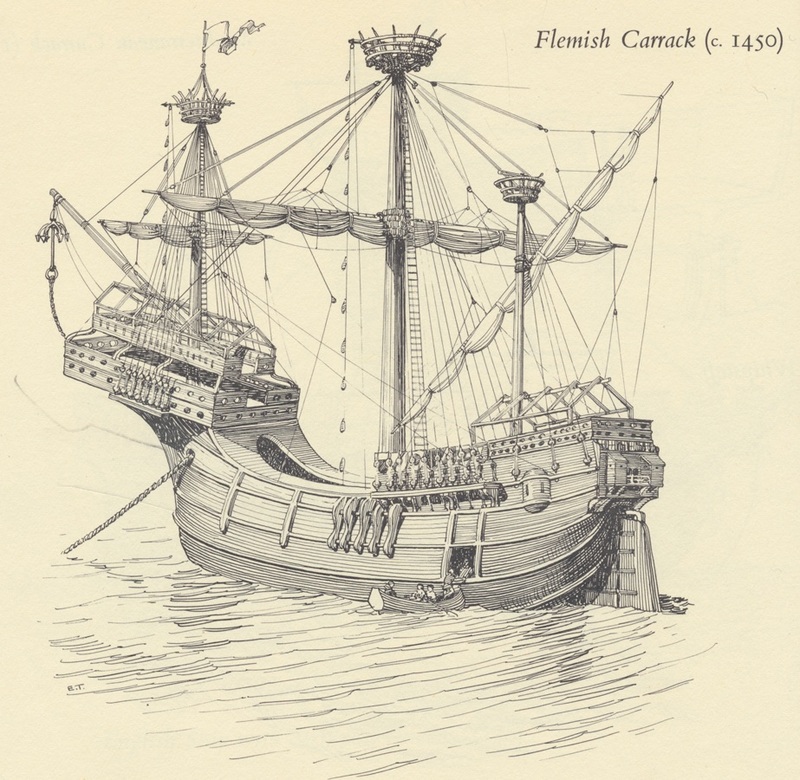 Although today many people have a low opinion of Arneson as a draftsman, he surely could trace as well as anyone, and thus artwork by Arneson might contain primary elements with significant sophistication. Moreover, the meaning of a byline (when we're lucky enough to have one) in a fanzine is inherently ambiguous: often, it means something more like "submitted by" than "created by." 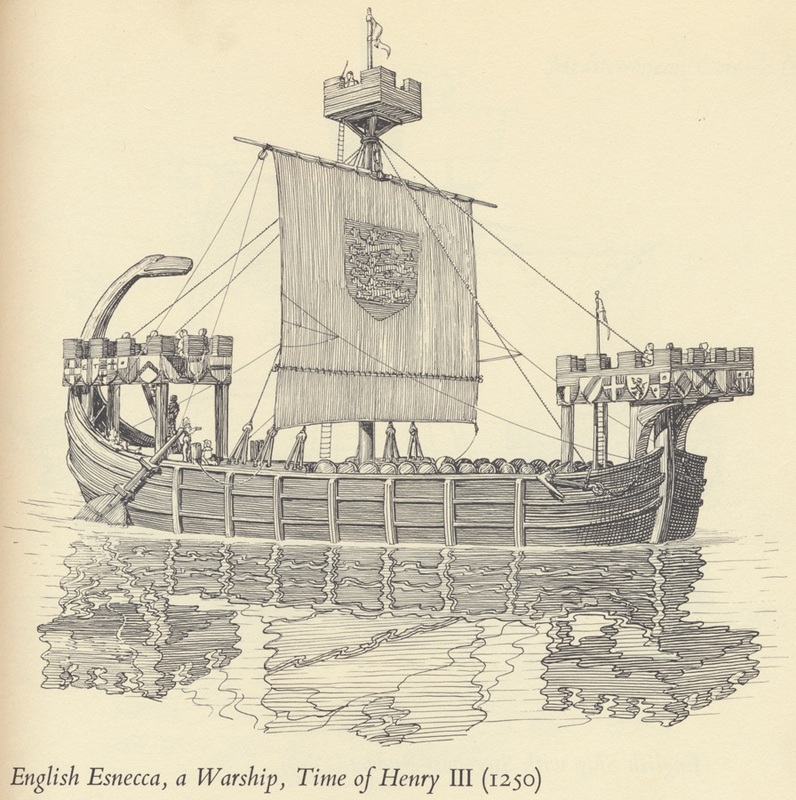 In Domesday Book #12, Arneson is given credit for an article called "Lincolnshire," though the text of the article is a photocopy of an English translation of the original, medieval Latin Domesday Book section on the city of Lincolnshire. Surely no one would think Arneson produced it, he merely submitted it. 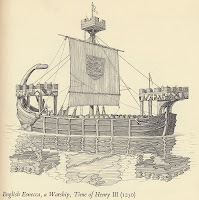 A scholar could however read the "Evolution of Naval Warfare" in Domesday Book #9 and walk away with a wholly erroneous impression of Arneson's writing style. Similar pitfalls await us when we try to ascertain his capability as an artist. That image is close, but certainly the Domesday Book image isn't a trace of that one. 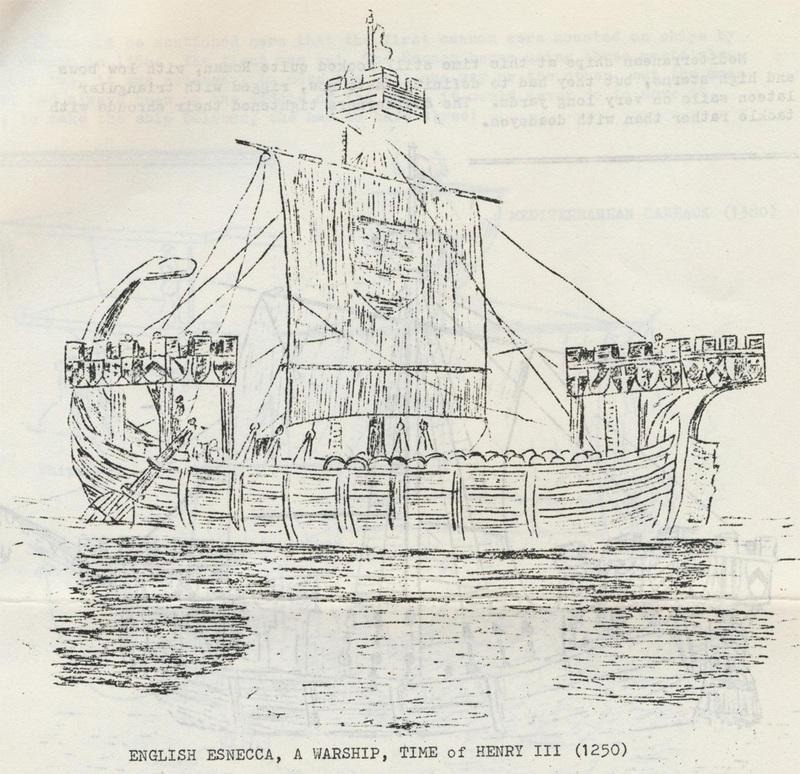 There are some Venetian galleys in Tunis as well, but none that served as the clear prototype for the one in DB#9. 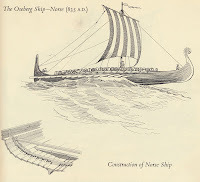 We may yet stumble over a clear original - or it may be that Arneson constructed this himself, though obviously based on studying several originals.